People talk about the ‘luck of the Irish’ and while that concept is dubious, it’s certainly true that the history of the Irish people is one where myths and superstitions played a big role. There is a list of Irish superstitions as long as your arm, so we have picked out 10 which promise good luck and ten which are premonitions of bad luck, if the legends are to be believed. 1. It’s said that if you meet a red haired woman or girl first thing in the morning you will have bad luck all day. 2. Don’t get a hair-cut in Lent as superstition says that your hair will never grow back again. 3. Vain people who spend too much time in front of the mirror will one day see the devil over their shoulder. 4. Probably not going to happen, but if a weasel stands up and stares in your face it is a very bad sign. 5. 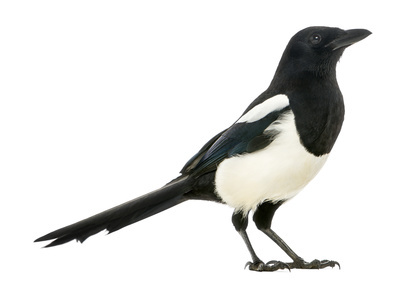 Seeing a lone magpie is unlucky, and if you kill a robin you will have bad luck for the rest of your days. 6. If you drop a pair of scissors onto the floor then disappointment is heading your way. 7. Lighting 3 cigarettes with the same match is a no-no, but probably the best advice is to quit smoking altogether. 8. Don’t stir your coffee or tea anti-clockwise if you want to stay lucky. 9. And never burn a pack of playing cards, no matter how much of a losing streak you’ve been on. 10. Finally, be careful not to knock over chair while standing up as this is also a sign that bad things are coming your way. 1. Don’t get upset next time a bird unloads some poop onto you, as in Ireland this is regarded as good luck. 2. Say rabbit 3 times on the first day of the month for the rest of that month to bring good fortune. 3. If you put your clothes on inside-out by accident, don’t change as it’s good luck to keep them that way. 4. Finding a half-penny is supposed to be lucky, but difficult to do since the Irish Central Bank stopped producing them in 1987. 5. An itchy left palm means money is coming your way. 6. A four leafed shamrock is a well-known symbol of good luck. 8. If you see a white horse in the morning it’s a positive omen. 9. Some say black cats are unlucky but seeing one first thing in Ireland is a good sign. 10. When sparks fly out of your fire it means you are going to come into some cash. Feeling lucky? If fortune has been smiling upon you then this might be just the time to try your luck on the Irish Lotto. May the luck of the Irish be with you!